Today’s post is another one of Cammie’s beautiful nature scenes using the Stampin Up Butterfly Basics Stamp set #137154. Cammie brings the card to life by hand cutting and popping the flower image and she uses the coordinating Stampin Up Butterfly thinlits #137360. The Butterfly Basics and the Butterfly Thinlits are available as a Stampin Up bundle so when purchasing together you save 15%. The cute little baby card is so precious and of course Cammie mastered this creation by combining the soon to be retired Stampin Up Bundeld Baby #133842 stampset with the Butterfly Basics #137154 stampset. She used her brayering and sponging skills to create the perfect setting to place the baby. Cammie loves the fun of watercoloring these line-art babies and finding ways to share these little bundles of joy. 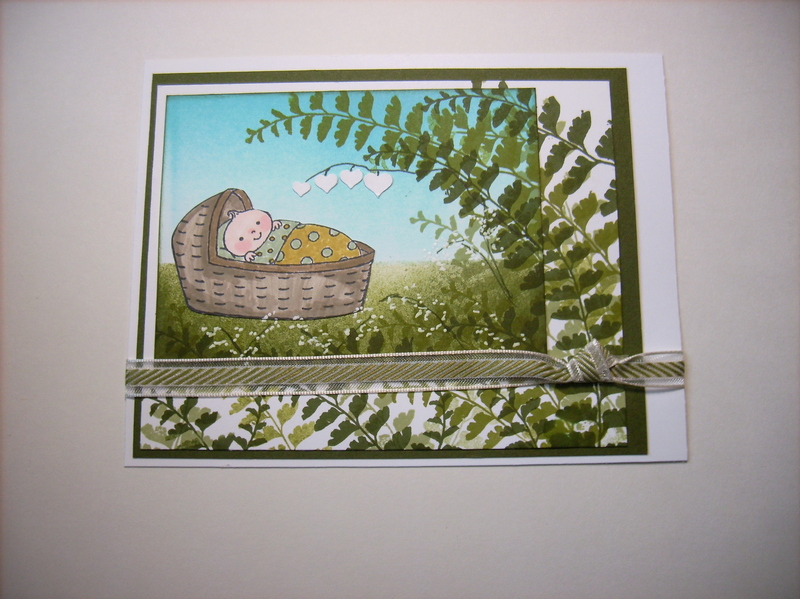 The Bundled Baby is one of many stamps on the Stampin Up retirement list. Be sure to check the retirement list out before they are gone forever. Every Tuesday, Stampin Up introduces their weekly deals on current products. Check out the latest batch of Stampin Up deals. This weeks deals end on May 4th so check them out and order quickly so you don’t miss out! If you’re all about nature, you’ll love where the Stampin Up Moon Lake # 137149 set takes your imagination. 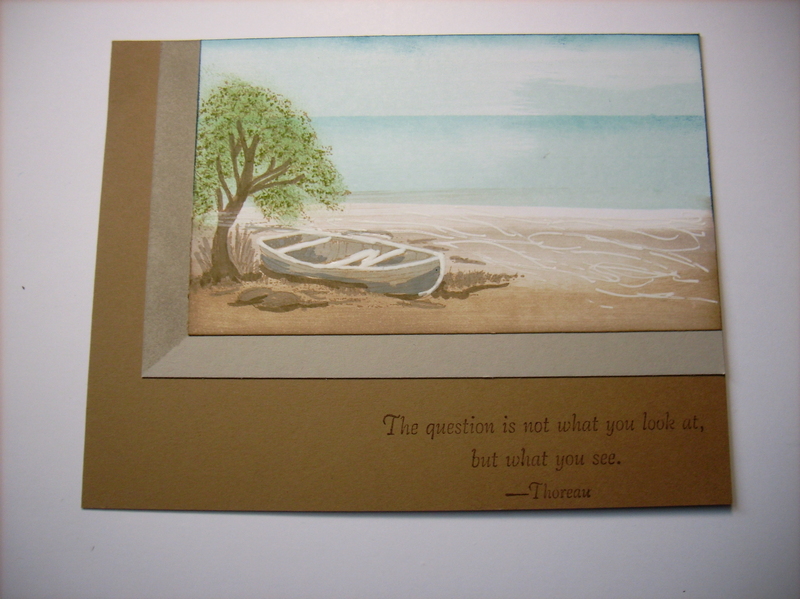 Cammie definitely leans toward the nature sets and the created this picture perfect card to showcase her love for relaxing on a beach. Today’s post is absoulutely stunning in real life and really shows what Cammie can do with a great Stampin Up bundle in the occasions catalog. 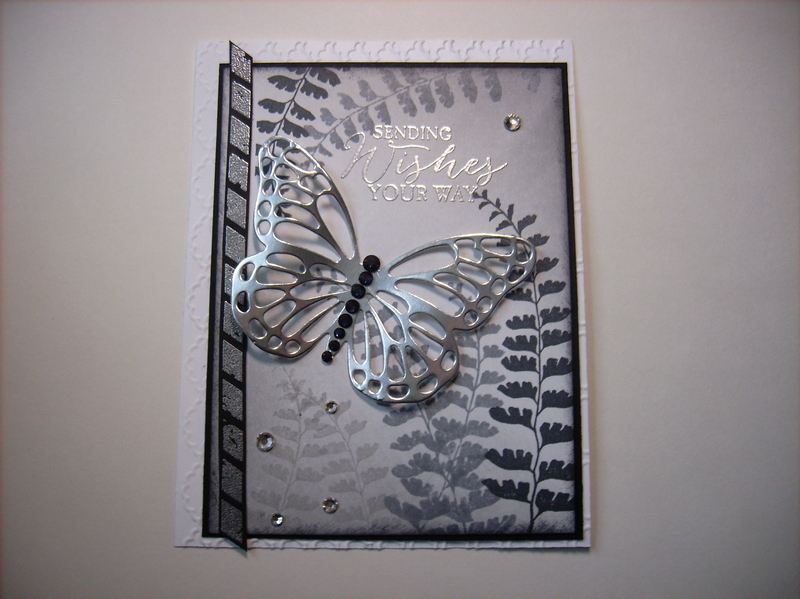 The Butterfly Basics # 138816 stamped images are a mix of organic images, backgrounds, and sentiments and then paired with the stunning Butterfly Thinlits die # 137360 this card really takes flight! After a (very) long migration, the Butterflies Thinlits Dies have landed in our warehouse and are now available for purchase! 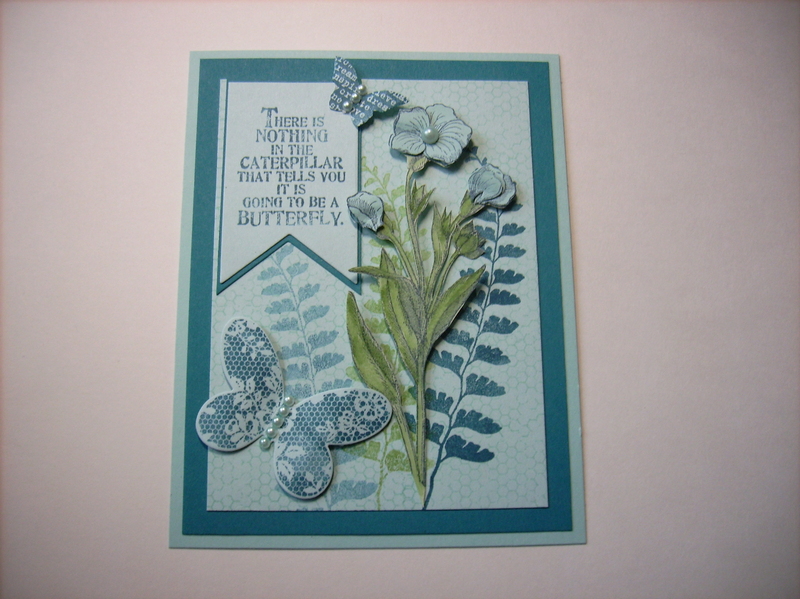 Because of the availability issues with the butterfly thinlits, Stampin Up is offering 2 incentives through 30 April. 1.Get the Butterflies Thinlits at a 15 percent discount–just $21.20! Buy any of the Butterflies Thinlits Bundles–already discounted 15 percent–and choose one of three FREE Sale-A-Bration items (only available while supplies last)! For today’s post Cammie combined 2 of the Stampin Up polymer stamp sets: Snuggles and Smooches #140326 and Big on You # 137151. The background was customized by randomly stamping the snuggles and smooches stamp set. The black circle is a piece of the all new chalkboard paper #137786 and then the sentiment is stamped with the whisper White chalk ink. 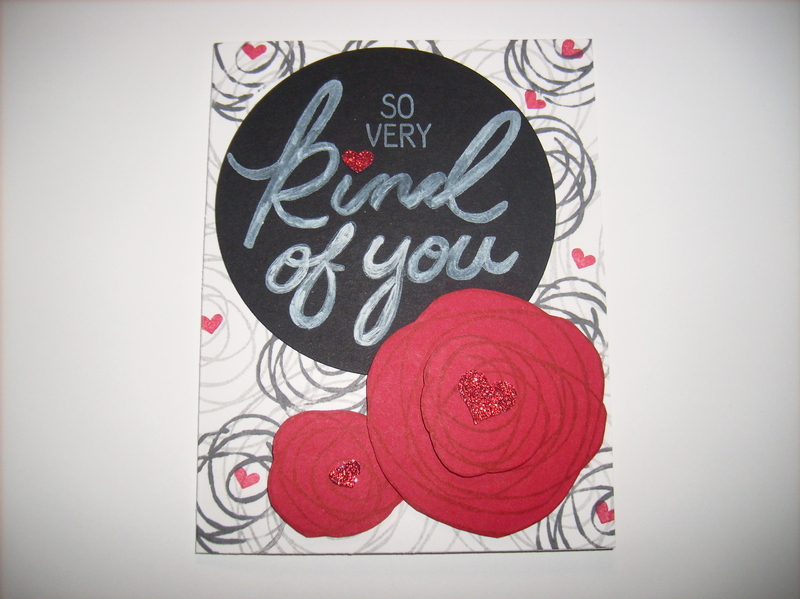 Finally Cammie added handcut Real Red roses using the image from the Snuggles and Smooches stamp set. It’s the 25th of the month so its time for a Christmas post! 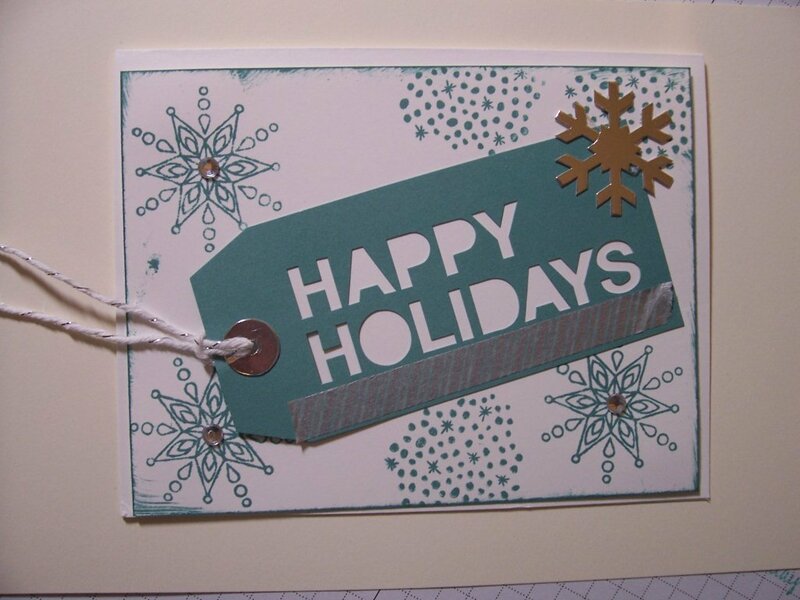 Today’s post is a simple design using all retired products but none the same you can recreate using new similar snowflakes and tag. Speaking of retiring products, Stampin Up has published their retired list of products that will be gone soon. The stamps on the list will remain through June 2nd but all the other products will be available while supplies last or through June 2nd which ever comes first.